For many people, their childhood lunches were full of PB&J, Chicken Soup with Stars, and Spaghetti-O’s. I know mine was! As I grew older, I moved on from Spaghetti O’s, I mean they weren’t that exciting right? But then childhood catches up with you…or rather you want your children to experience parts of your childhood that you remember, even if that means the full of not real ingredients in a BPA can because healthy spaghetti o’s those cans are not! Oh yeah… hmmm now what was I to do? 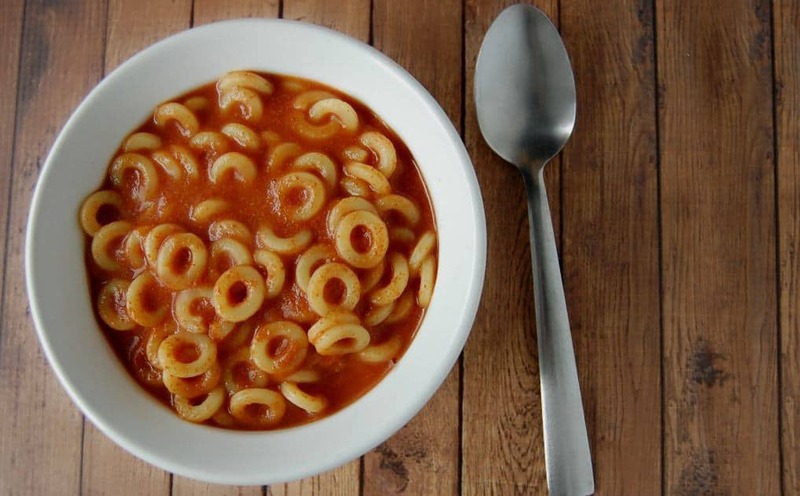 I wanted to surprise my kids and let them in on this childhood classic (which by the way, they had no idea it existed before this) but I didn’t really want to but the same Spaghetti O’s that I grew up on. They are tasty and all but they aren’t really the healthiest lunch on the block. Water, tomato puree, enriched pasta, high fructose corn syrup, salt, enzyme modified cheddar cheese, vegetable oil (corn, canola, and/or soybean)enzyme modified butter, skim milk, citric acid, paprika extract, onion extract, flavoring. I’m actually a bit confused about some of these ingredients. I feel like a lot of brands are moving away from HFCS so I’m pretty shocked to see it in a kids’ lunch product. There’s vegetable oil which is not a very healthy oil plus the oils they use are sure to be GMO. What’s with the enzyme modified cheese and butter? Couldn’t they have just used good old butter and cheese in their natural states? I didn’t want to give my kids food with that ingredient list and especially food that was in a can that is likely lined with BPA. Kids don’t need added synthetic hormones. So what did this crazy crunchy mama do? I made my own healthy Spaghetti O’s! As it turns out, Spaghetti O’s are not so hard to make. I mean think about it. It’s essentially spaghetti or tomato soup with noodles! There’s a bit of seasoning work that obviously makes things unique but it really is a pretty simple dish. Most of the ingredients are similar to the canned Spaghetti O’s (well if the real ingredients had been used) but you’ll notice I did not use cheddar cheese. I don’t have a problem with cheese in fact I do love it but I wanted to use something that I always have on had, dissolves a bit easier than cheese, and has a great nutrient profile. What do I use instead? Nutritional yeast! Nutritional yeast is most known for it’s B-complex vitamins. It also just so happens to have a cheesy taste so it’s a great substitute! 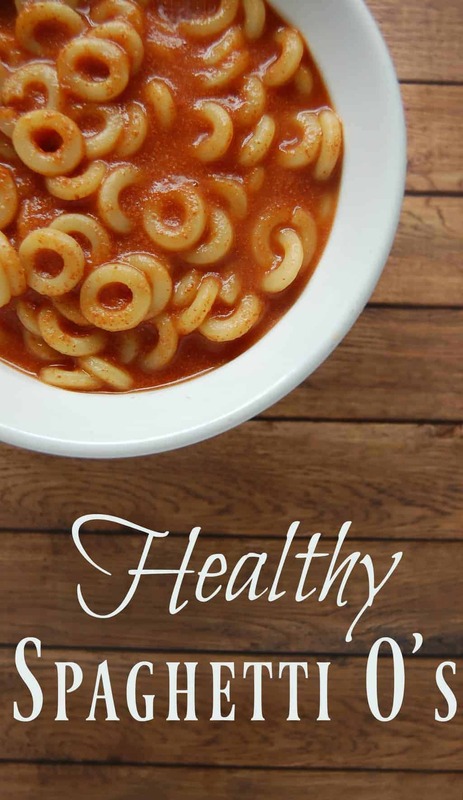 If you are dairy free or vegan, you can still make these healthy Spaghetti O’s! All you need to do is swap the milk for your favorite milk alternative and swap the butter for coconut oil! I also use stevia in place of sugar (or the above mentioned HFCS). In medium pot, mix together, tomato paste, water, milk, onion powder, paprika, salt, nutritional yeast, butter, and stevia. Cook over medium heat until hot and ingredients are well mixed. Really Good! And easy, too. Who needs a can? And if you use small egg noodles you will bump up the nutrition of this dish. A trick I learned from the Sneaky Chef is to add a jar or baby sweet potatoes or squash to the sauce. Adds sweetness and extra nutrients. And as the picky eater in my family, you really can’t tell. If the sauce looks too orange (we picky kids are picky about lots of things), add a bit more tomato paste. I also add the chicken broth in place of the water and cook the noodles in the sauce broth combo; more flavor and nutrients and you now have a one pot dish.